Golden Pheasant Complete Head No. 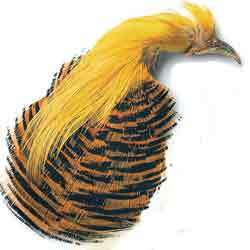 2, this Golden Pheasant includes the crest & collar feathers, the no2 is a complete head of lesser quality than a 1st grade but still with plenty of useable feathers. I didn't buy the top quality as I wanted it for the toppins ( Kate McClaren, Silver Invicta) but there were plenty of useable feathers plus of course the tippets for other flies such as Pennells.. Overall I'm happy with the head for the money.